Porto coach Andre Villas-Boas looks set to join Chelsea following the sacking of Carlo Ancelotti in May. 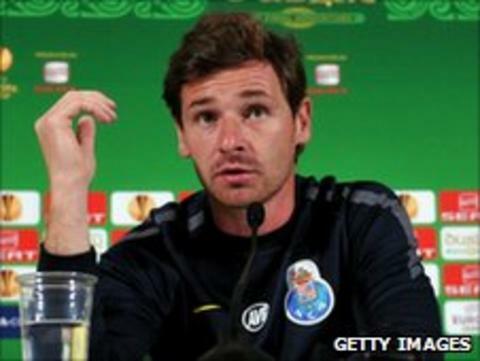 Villas-Boas, 33, guided Porto to the Europa League title last season. Chelsea are awaiting developments in Portugal before confirming Villas-Boas as Ancelotti's successor, with progress possible on Tuesday or Wednesday. The Portuguese has a clause in his contract that allows him to leave Porto should another club offer £13.2m for his services. In a statement, Porto said they had yet to receive an offer that activated the release clause. "So far this club has not received any communication that this clause has been exercised, nor of the agreement of the coach that is desired," the statement read. Chelsea said they hope to make an announcement about their new manager before the end of the week. Porto president Pinto da Costa said the club could not prevent Villas-Boas leaving should certain financial conditions be met. "Villas-Boas has a contract and a clause of 15m euros," he confirmed. "If someone deposits 15m euros into our account and he wants to go, we can not do anything because it is something that is contractually specified." A Chelsea statement said: "We hope to be able to make an announcement regarding the new manager in the next few days or so, but until then we will not be commenting further on the speculation surrounding that appointment." Porto also clinched a domestic double under Villas-Boas last season, winning the league and the league cup. Guus Hiddink has also been linked with a return to Chelsea, where he won the FA Cup as a caretaker manager in 2009, although the chance of this happening appears to be receding. Villas-Boas, who speaks fluent English, was a scout for compatriot Jose Mourinho at Porto, Chelsea and Inter Milan. He also worked with Sir Bobby Robson during the former England manager's spell in charge of Porto. His first club managerial role was with Portuguese club Academica, who he joined in October 2009 with the club winless and bottom of the first division. He guided them to an 11th-placed finish and a Portuguese League Cup semi-final before leaving to take over at Porto in June 2010. Porto ended last season unbeaten in league with 27 wins in 30 matches, becoming only the second Portuguese club to finish a league season unbeaten, after Benfica in 1972-73. Ancelotti was sacked by Chelsea following a season without any silverware, with the London club finishing runners-up to Manchester United in the Premier League. Numerous candidates have been touted as possible replacements for the Italian, among them Turkey boss Hiddink, Villas-Boas and former Fulham, Manchester City and Blackburn Rovers boss Mark Hughes.